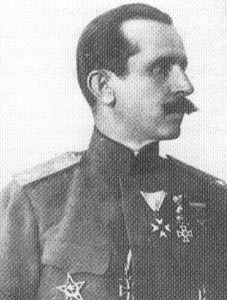 Major-General Nikola Zhekov, the pro-German Commander of the Bulgarian Armed Forces. Albania: Bulgar First Army takes Elbasan. Champagne: German success between Tahure and Somme-py; French counter­attacks fail on February 14-16. Vosges­: Between Seppois and French frontier, Germans penetrate and hold French positions on February 13-14. Mesopotamia: Kut first bombed from air. 140 Indian scurvy cases next day, c.5 per day thereon. French West Africa: Tuareg chief Firhoun again rebels, attacking Menaka (and on March 13 and 28). Allies notify Greece of Montenegrin Army’s transfer to Greek island of Corfu, arrives on February 16. Germany: 2,000 periodicals reported to have ceased due to paper shortage.